Can the Windows Store possibly be ready by Oct. 26? 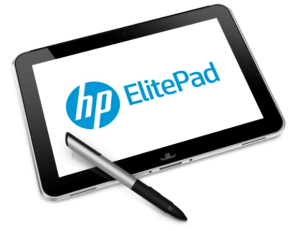 HP's upcoming ElitePad 900 tablet seems like a solid option for Windows 8 business users, until you read the fine print. The ElitePad 900's 10-inch screen has a resolution of 1280 by 800. Most Windows 8 tablets we've seen so far have a higher resolution than that, and for good reason: Microsoft requires resolution of at least 1366 by 768 for Windows 8's “Snap” feature. Snap lets you run two Metro-style apps side by side, with one of the apps appearing as a slim sidebar along the left edge of the screen. It's useful for watching a video while keeping an eye on Twitter, browsing the Web while monitoring your e-mail or keeping a Metro-style app in view while accessing the traditional desktop. No other tablet operating system has a feature like this, with support across much of the app ecosystem. It's disappointing to see HP skimp on the display and therefore eliminate one of Windows 8's unique features, especially when other PC makers have not done so. Dell's Latitude 10, for instance, manages to reach the minimum 1366-by-768 resolution. Several Windows RT tablets, such as Microsoft's Surface and Samsung's ATIV, also have a good enough resolution for Snap. Perhaps HP cut corners to achieve a lower price, but we won't know that until the company puts a price tag on the ElitePad 900. For now, it looks like a tablet worth skipping if you truly want to take advantage of all that Windows 8 has to offer. Update: HP reached out to explain why it went with 1280-by-800 resolution in the ElitePad 900. The company wanted a 16:10 aspect ratio, which in HP's opinion works better than 16:9 for desktop business applications such as Outlook and Excel. With Intel's Clover Trail chip, 1280-by-800 is the the highest possible 16:10 resolution available, so HP had to decide between its preferred aspect ratio or 1366-by-768 with Snap support. Because this is a business tablet -- it won't be sold in retail stores at all -- the company decided Snap was less important. That may be true for specific business settings that make extensive use of traditional desktop apps, and so calling the lack of Snap a "fatal flaw" was a bit harsh. Still, my feeling is that if businesses want to take advantage of all that Windows 8 tablets have to offer, and start moving away from legacy desktop apps, the lack of Snap is a major drawback.